The United States Congress designated the Rich Hole Wilderness (map) in 1988 and it now has a total of 6,532 acres. All of this wilderness is located in Virginia and is managed by the Forest Service. Rich Hole Wilderness consists primarily of Brushy Mountain and portions of Mill Mountain with their drainages, the North Branch of Simpson Creek and Alum Creek. The area exhibits a mature hardwood ecosystem with large old hemlocks in the drainage bottoms, and chestnut oaks and yellow pines on the south-facing slopes. In the late 1800s and early 1900s iron ore was mined from some of the hillsides in this area, and trees were cut to make charcoal for the iron ore furnaces. Traces of this activity, including an old mountain homestead with a small orchard, remain today in Rich Hole Wilderness. The six-mile Rich Hole Trail (FT # 464) passes through the southern half of the wilderness, most of it along the North Branch of Simpson Creek. Trail information is available on National Geographic-Trails Illustrated Map # 788 (Covington-Alleghany Highlands). Rich Hole Wilderness includes the 1,336 acre Rich Hole National Natural Landmark (NNL), an example of mature southern Appalachian cove hardwood forest. A major wildfire burned in the wilderness and adjacent lands in April 2012. Visible evidence of the effects of this fire are evident throughout the wilderness. 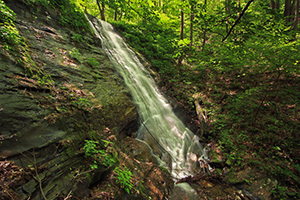 Rich Hole Wilderness is managed by the U.S. Forest Service as a part of the James River Ranger District of the George Washington & Jefferson National Forests. Planning to Visit the Rich Hole Wilderness? How to follow the seven standard Leave No Trace principles differs in different parts of the country (desert vs. Rocky Mountains). Click on any of the principles listed below to learn more about how they apply in the Rich Hole Wilderness.